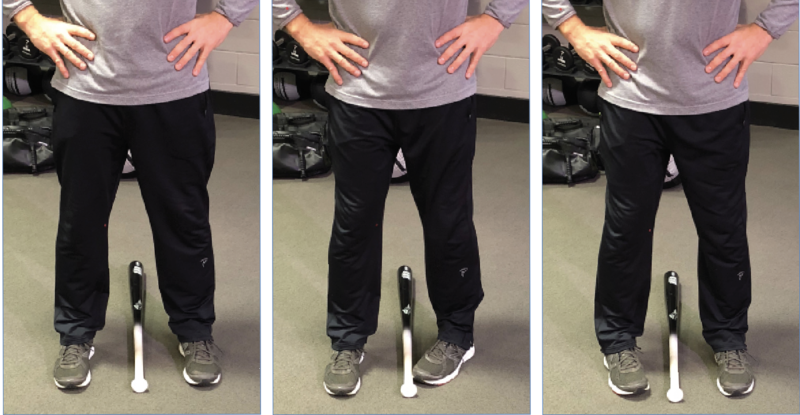 The Toe Tap Test evaluates hip internal rotation and highlights any limitations that may affect the players ability to load the hips. This is a good way to measure the internal rotational mobility of the lower quarter. Hip and tibial internal rotation and foot inversion are essential for proper throwing or hitting. The hip, tibia and foot coil and load on the trail leg during the negative move and rotate and post in the lead leg during the positive move and acceleration phase. There is potential for excessive lateral motion in throwing or hitting (sway and slide) anytime a player finds restrictions in internal rotation of the lower quarter. Have the player stand with their feet one of their own foot lengths apart. Use a bat to help get into the correct starting position (see picture below). Now place the handle of a bat directly between the feet. Have the player try to rotate the left toe inwards (keeping the heel down) to touch the bat. This forces the player to rotate around the testing leg. The toe should easily reach the bat. Repeat on the other leg and compare. Each lower quarter should be able to rotate enough to touch the bat.